The first full draft of my “Banjo Evolution” article is finished. I’m a singer/songwriter who “cut my teeth” on banjo and guitar during the Folk Revival. When the banjo went out of style, I stopped bringing it to gigs so much because people would make assumptions about me just because I still brought my banjo to gigs. Now that I’m officially old enough to get the senior discount anywhere in the country, I’m not so worried about what people think. In fact I’ve become a sort of evangelist for banjos of all kinds. Nowadays I get a lot of reader or audience questions about why there are so many kinds of banjos. It’s impossible to explain that without explaining some of the history of the banjo. Recently I put on a presentation on that very subject, so I figured I’d put the meat of that presentation (and the handouts I prepared for it) into an article. That link is further down. 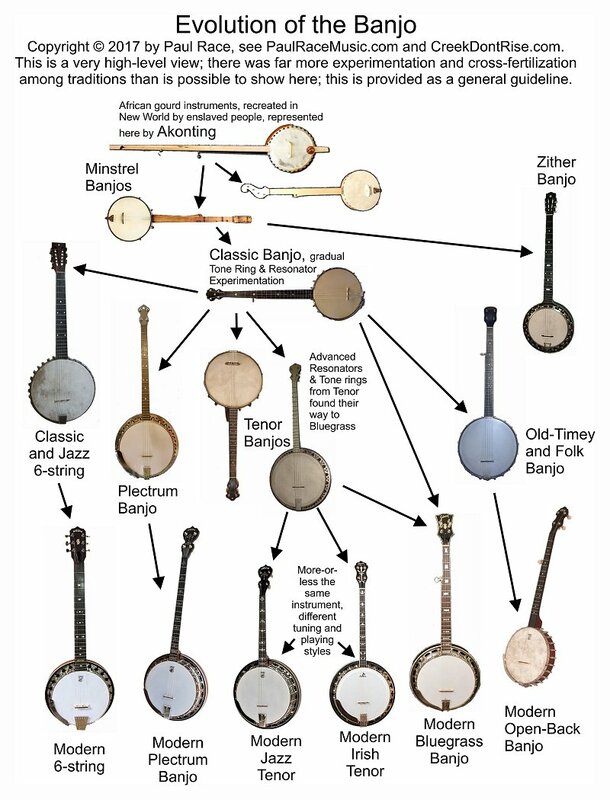 But I wanted to put one of the most important points of the article here: Although some of the banjos are apparently the direct descendants of earlier instruments, many of the banjos that have come and gone through the decades since 1870 were more-or-less invented at the same time. It was changing musical tastes that brought one, then another, then another configuration into and out of style. Alongside that unimaginable success, there were hundreds of experiments that went nowhere, or which survived for a few years in one specific usage that later fell out of fashion. On top of that there were at least a dozen popular ways to play the thing, although only a few have survived to this day (each of whose proponents are eager to tell you you’re playing the banjo wrong if you don’t follow the tradition they do). Here’s the big caveat: in my research, I turned up a number of things that go against “common wisdom” or the “received text” or whatever you want to call it. So I am open to tweaking if you see something that you know needs adjustment (from original sources, not from old wives’ tales in your circle of friends). For the whole story, click on the graphic below. Don’t bother trying to read every little thing on the chart – once you get to the article, you can download full-page pdfs you can print off and read.